Tool Blog News Porter-Cable's New 1-Gallon Trim Compressor - Or Is It? 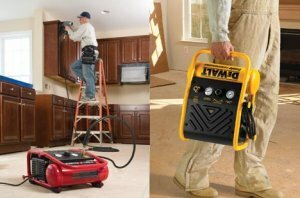 I am a fan of small lightweight air compressors and have been using a small 1-gallon for years now on the jobsite. So when I got news about a new 1-gallon from Porter-Cable, the excitement began to flow; that is until I realized that the new C1010 compressor from Porter-Cable is the same as the D55140 from DeWalt. Not that there is anything wrong with the DeWalt, it's just that the new compressor is not really new. The specification for both units are almost identical, with the C1010 coming it at 71 decibels, which is 2 decibels higher then the DeWalt; the rest of that stats are the same. Both weigh 24-pounds, have a motor with a draw of only 2.6 amps, and have a rather quick 20-second recovery. So why is there a 2 decibel difference? My guess is just a difference in testing. The Porter-Cable is expected to retail for $139, but Amazon currently has the DeWalt for less then $130. I expect Amazon will offer a lower price for the C1010 down the road. So, red or yellow? If this wasn't confusing enough, Senco's 1-gallon compressor is Model number PC1010.